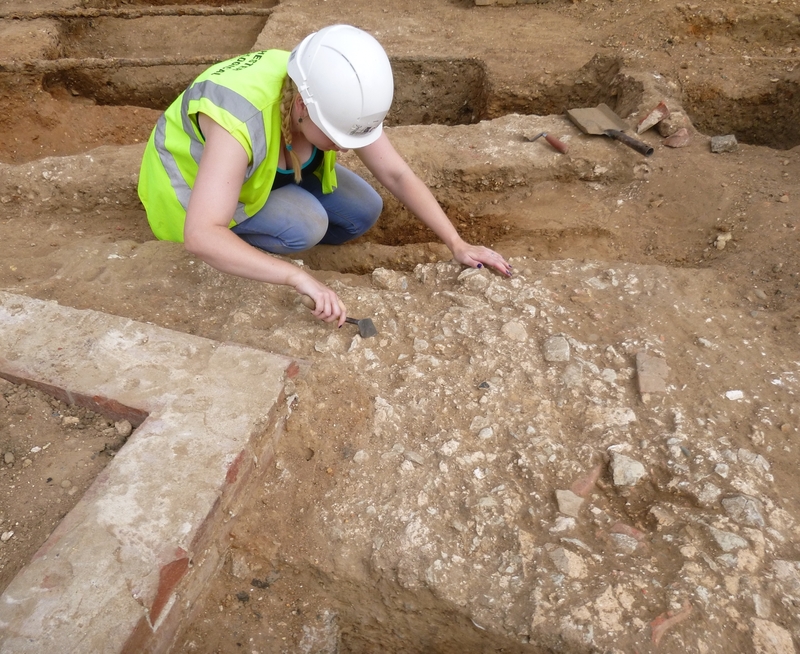 On Monday (4th January), the Trust resumed work on our site at the Flagstaff House complex, within in the old garrison at Colchester and round the corner from the Roman circus centre and the Trust’s HQ. We started work on the site in July 2015 with an evaluation for mitigation purposes, having monitored ground investigations on the site in 2013. The evaluation led into our excavation of the site, and we completed the excavation at Christmas. 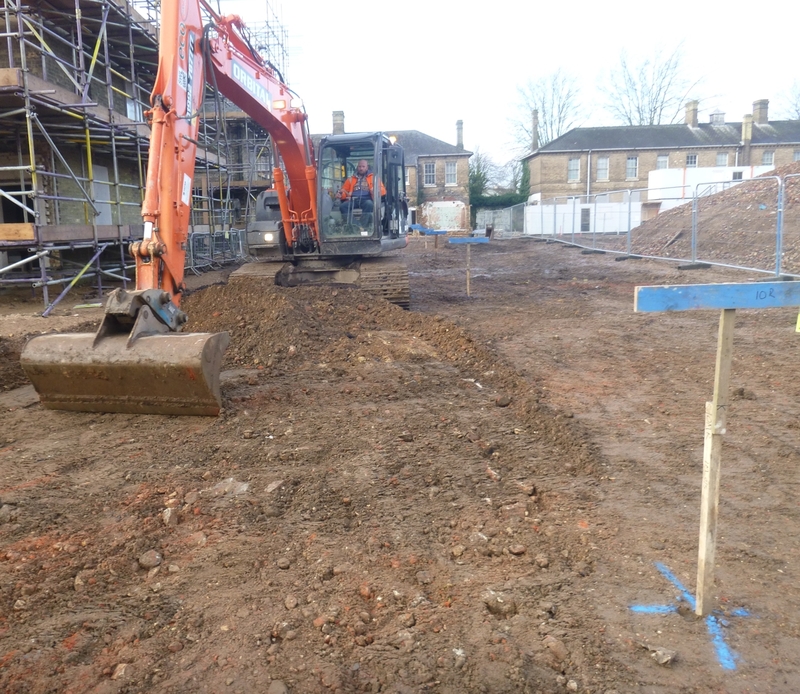 Our work on the site has now become a watching brief on groundworks ahead of construction. We excavated several areas of the site (grouped as Areas A, B and C). Areas A and B were on the site of the Roman circus and the northern part of Area C was near St John’s abbey precinct wall. The site has produced interesting and also some important evidence: ie painted wall-plaster deriving from a Roman house to the north of the circus and Roman domestic material from a large rubbish-pit; foundations of part of the precinct wall of St John’s abbey; and the remains of modern military buildings. We also uncovered further evidence of the Roman circus. The historic Flagstaff House complex of buildings was, perhaps, the most important part of the old Army garrison, as it housed the garrison’s commanding officers and, also, later became the HQ of the Army’s Eastern Region. 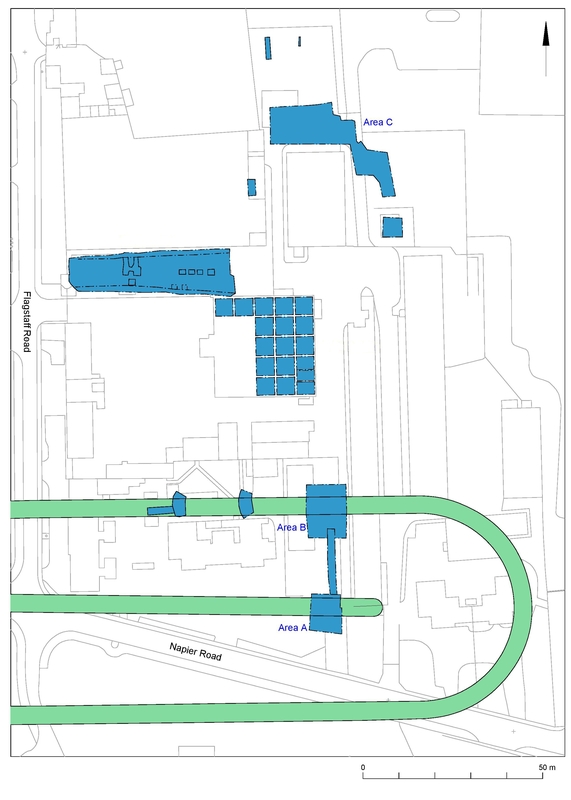 Of the buildings shown on the rough site plan below, some have now been demolished, but the surviving buildings are to be preserved and re-used. We have undertaken a recording project on some of the buildings. Because the site includes part of the site of the Roman circus, the residential development on the site, including the renovated military buildings, is to be called ‘Arena Place’. 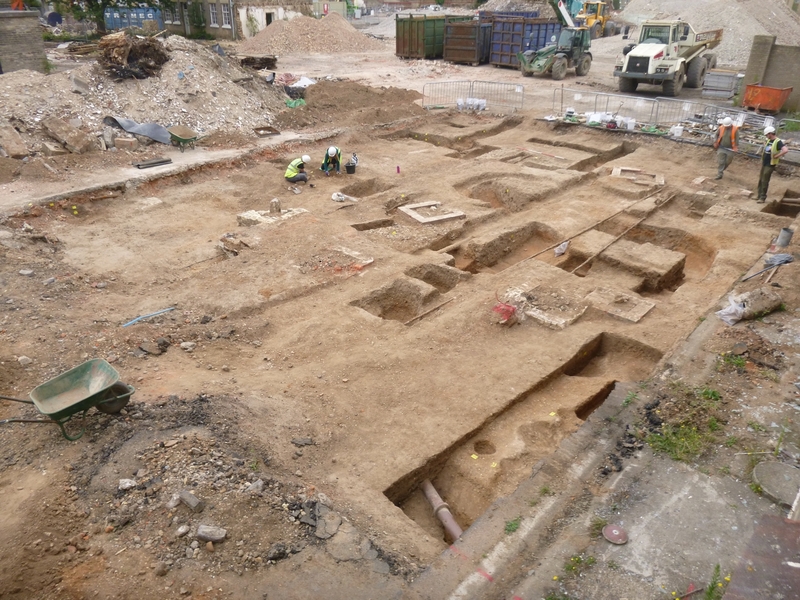 The excavation has provided more evidence of this part of the Roman circus, including the eastern end of the central barrier, but we were not able to fix the easternmost point of the eastern end of the circus because that area was not available for investigation. We uncovered what we expected to uncover of the circus remains, and we did not expose much of these: they were also badly damaged by modern services. We did uncover part of the actual surface of the circus arena with circus demolition debris on top of it, and this demonstrated that the arena surface consisted of rough topsoil, and not a gravel or sand surface. We also retrieved new evidence in the form of a partial graffito. Another important find was a fragment of segmental brick which derives from one of the cones of the eastern turning-post of the circus. We also found evidence of a possible water-tank within the circus. The evidence of the Roman house included iron nails, personal items such as a spoon and a hairpin, discarded oystershells, coins, and pottery, some fragments of which represent a rare Roman pottery vessel (a samian ware cantharus), as well as the painted wall-plaster. The partial graffito was incised by hand on a large curving fragment of pink, waterproof Roman mortar (opus signinum) which had been painted with a red surface. This fragment derives from the structure of the circus. Expert Roger Tomlin thinks that the partial graffito represents the numerals VIII, written in reverse order, and was possibly a tally (pers comm). Roger says that a similar inscription has been found on a column in the Roman amphitheatre at Caerleon. Three coping stones from the Roman amphitheatre at Chester are inscribed with names, and one of these may have marked an individual’s seat. We have retrieved only relatively small numbers of painted opus signinum so far from the whole Roman circus, so the fact that one of these included a graffito suggests that the Roman circus must have been adorned with a lot of graffiti! The excavation was supervised by Trust archaeologist Mark Baister and carried out by a team of Trust excavators. The watching brief is being conducted by Trust excavator Robin Mathieson. See seven previous blog posts on this web-site about our work on the site and read all our fieldwork reports online at http://cat.essex.ac.uk/ . All our archaeological work on the Flagstaff House complex site is being funded by Taylor Wimpey plc. 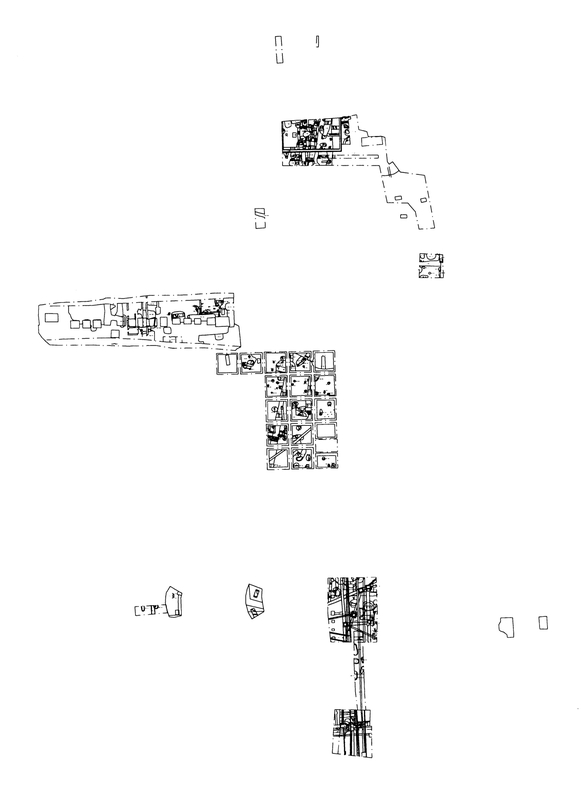 The images show: a) a rough site plan, including the three excavation areas (blue) and the site of the Roman circus (green); b) a preliminary results plan; and c) three site photo.s. The site photo.s show Area B and Trust archaeologist Emma Holloway excavating circus demolition debris in Area B (both taken in August 2015), and machine-stripping on the site (taken this week, on the 5th January 2016).